Phoenix Unbound is book 1 in the Fallen Empire series. I was drawn into this book by the cover, big shocker since I'm a cover lover. I'm so glad that the story was amazing and a must read for Fantasy Romance readers out there. I wasn't quite sure what to expect but I'm so glad I gave this a try since this is a book I won't soon forget. We start off meeting our leading lady, Gilene as she's being picked for the annual tithe, the Rites of Spring. A girl in each town is rounded up and taken to the Krael Empire each spring. People gather in the Empire to watch the gladiator fights and then to see the girls be sacrificed in a fire. Gilene has a secret though, she wields her fire magic and casts an illusion each year to escape only to come back the following year to do it all again. No one has caught onto this until Azarion, the deadliest gladiator, who somehow sees through her illusion. He wants his freedom from the slavers so they make a plan to escape and wind up on the run from the guards. Our duo winds up on a dangerous journey in attempt to get Azarion back in his rightful place as the leader of his clan. I was questioning if Gilene would be able to part from him when the time came though. 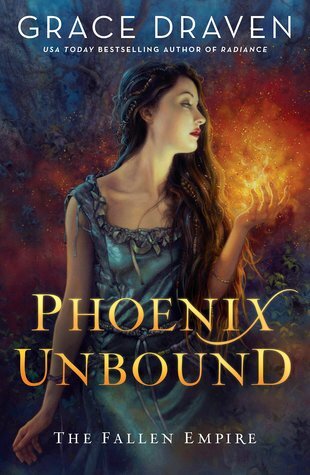 Phoenix Unbound is a captivating read. I had a hard time putting the novel down and though parts were dark it was balanced out with the romance and the adventure. This world building was done really well, and the characters were attention grabbing. The pace was on point and I just had a really good time reading it, I didn't notice a lag at any point and I just kept wanting more. If you're a fan of Fantasy Romance you NEED to grab this book.